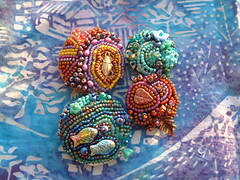 quiltworks / beads and beyond . this is a watercolor i made for my boyfriend, jesse. it is ~ 8 x 10". i matted it in a black double matte and framed it in simple black frame. i taught a class yesterday at quiltworks / beads and beyond in bellevue. 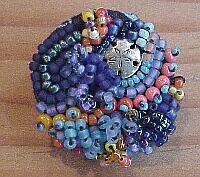 our project was a beaded house. this is mine in progress. click this photo to go to flickr and see the rest! yesterday was a quiet day. good. i went out to breakfast, then came home and worked on de-cluttering the kitchen. i later took a nap and read, then i had a massage and jesse and i had dinner, watched 2 episodes of dexter, and went to sleep. today i did a bit more cleaning in the kitchen, finished getting ready for my class tomorrow, and have painted a bit, read a bit, and slept a bit. going out later to make some photo copies and things. 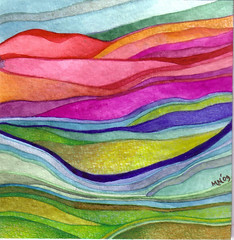 i also listed 4 new little pieces of art on etsy -- this is one of them. home from rose city.. it was a really good trip. jesse and i drove down to portland on saturday morning. we met up with his friend jennifer and explored the saturday market a bit - it was fun but packed since it was their 1st weekend at their new expanded location. homemade coffee icecream with toffee bits for the win. then we wandered around a bit, and went to powells. i had never been there before - really! it was pretty cool. we all got some books. i think i could have settled for a good long while in the children's book room! i am a junkie for children's books. they have the best pictures, though! then we had a wonderful dinner at mama mia's. they had gluten free pasta! and the broccoli, cooked in olive oil and garlic. after that we checked into our hotel - which was awesome. a really nice room. it had a little kitchen, a living room area, and a huge comfy bed. it was near the water and nice and quiet. a good deal. after that we took jennifer home and saw a bit of her neighborhood -- Hawthorne, which was very cool. then off to sleep. sunday morning we enjoyed the free breakfast - far superior to most free hotel breakfasts, then wandered hawthorne a bit - went to the yarn garden! they had the Diarufuran diakeito yarn i needed for the fit-n-flare trumpet skirt in knitting ligerie style - which i had such a hard time finding even online! so that was pretty awesome. (this is the skirt, by the way : trumpet skirt. 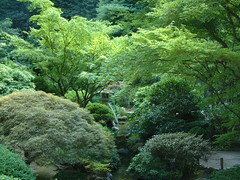 then we went to the rose gardens and the japanese gardens - so beautiful and peaceful! then dinner and off back to seattle. it was a long drive home and i was nodding off - so it's a good thing jesse was driving. it was a great trip and it was just SO GOOD to get away and relax. i really like portland and i liked jesse's friend and we just had a really good time. we'll go back soon and see her again when she comes to seattle soon. we already have a list of things we want to do NEXT trip. next time we will take the train. it's great to live fairly close to a fun city like portland. class went well today. it was a good group - from beginners to experienced beaders and quilters. more quilty-sorts than beady-sorts, i think, but a good group and a good mix. 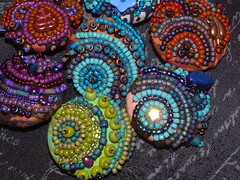 the button in the middle is the one i made today during class. all my students seemed to enjoy themselves. i am not sure yet if next friday's class will have enough students to go through - i'll know in a few days! someone was telling me today that my doodles would make cute dolls. well, they HAVE made cute dolls, though not lately. 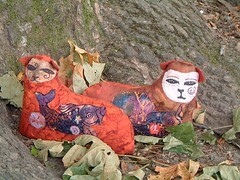 I made these 2 cat dolls for plush you a couple of years ago. As I recall they were 6--8" long each. The bodies are hand and machine appliqued and embroidered and the faces are hand embroidered and drawn with fabric pen. Meow! 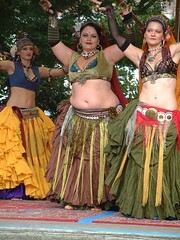 another photo from totally tribal dance festival. this is inFusion. the costumes, of course, are one of the best parts. this group had the best flowy skirt action! 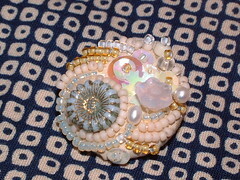 another beaded button.. this one features vintage and contemporary sequins, fresh water pearls, seed beads, and vintage and contemporary pressed glass beads. 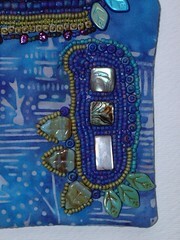 all beaded on cream colored batik fabric. which does not really show but affects my design anyway. 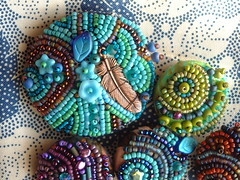 this is what i was working on yesterday and last night.. more beaded buttons. my class is coming up on Friday. this is a woman from hands of kali, one of my favorite groups i saw this weekend at : totally tribal dance festival in bothell washington. they were really amazing. i will post more photos, too. i have a lot to sort through! 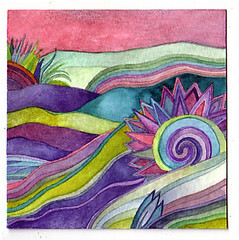 two of my favorite Batik Artists have Etsy shops now! Now this is why I am so well dressed. i had a great weekend and have lots of pictures to prove it. i hope i can upload them tonight! in the meantime, here is a picture of my latest cool art project.. well, one of them. starbucks sells these travel mugs intended for you to put your own photos in. they come with a template. i traced around the template and created an original painting. 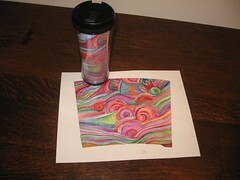 then i made a color copy of the original and i have made several travel mugs ... pretty neat, huh? i plan to make some more designs to use as gifts. 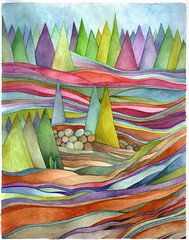 another recent watercolor and another update. let's see if i can do this more often. my friends peter and karen are in town with their daughter ingrid to celebrate her 2nd birthday. jesse and i were invited and it was fun to see them yesterday at her cookout party at woodland park. to catch up and watch all the little kids enjoy themselves. i have not been to woodland park since >i< was a little kid. then a quiet evening. i am hoping today is quiet too, the weather is not really ideal for outdoor activities. maybe idea for snuggling, reading, knitting, and watching dvds. i need to do a few chores as well. goodness, i have been meaning to update! i have been mostly busy with my day job lately. we are very busy and short people so it has kept me hoping and left me with a lack of energy for other things at the end of the day. so i've been painting a little but mostly reading mystery novels (kay scarpetta series.) 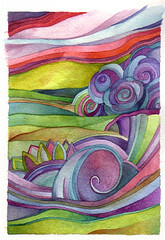 this is one i finished a few weeks ago, and i just listed it and another small watercolor on etsy. today i want to say happy birthday to kathy - i am thinking of you, kathy! see you next weekend!